97% of participants rated the overall educational value of the meeting as excellent with 100% saying the day met with their expectations. In terms of rating the meeting more specifically, 94% said it was an ideal forum for learning new information, 83% said it was valuable for sharing best practice and over 50% found it really helpful for networking. Of most importance was that 92% felt that the meeting would help to significantly improve their clinical practice in the future. 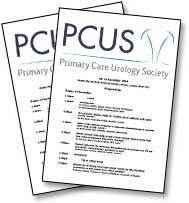 PCUS is committed to delivering valued education that can help make a positive difference to delivering primary care.